We had the pleasure of visiting Charleston sans kids last week. A business conference brought us there, so we didn’t have a lot of time to explore during the day, but we did get to eat dinner out most every night, and that was a treat in itself. On our first night, we visited the Oak Steakhouse. My husband recommended it to me since he had visited with friends a few years ago. I was unsure, because at the time Urbanspoon had only rated it at 80%, and there were so many other choices rated higher. That was my first lesson in not always letting a few detracting reviews keep you away from a restaurant. It was our favorite from the visit. Odd because my favorite appetizer, entree and dessert all came from different restaurants. Not so odd when you consider what I heard Tom Colicchio quote on Top Chef: “People go to restaurants for food and they return for hospitality.” So truthful, at least in my case. Good service and a warm ambiance are a huge part of the experience and Oak Steakhouse has that in spades. When we first arrive, I am taken by the warm atmosphere and balcony overlooking the bar area down below. Upstairs was even more beautiful, with the large picture windows looking down on the street below and the murals painted on the walls. The curtains were heavy, sending me back to a Gone with the Wind kind of time. It was really magical for me. Our waiter came by and began what would be an amazing service for the rest of the night. He was so knowledgeable and helped guide us in our choices that night. He even brought us treats to sample from the chef. All were, of course, amazing. I thought we were going to bust there was so much food. And all so wonderful, you didn’t want to leave a scrap behind. 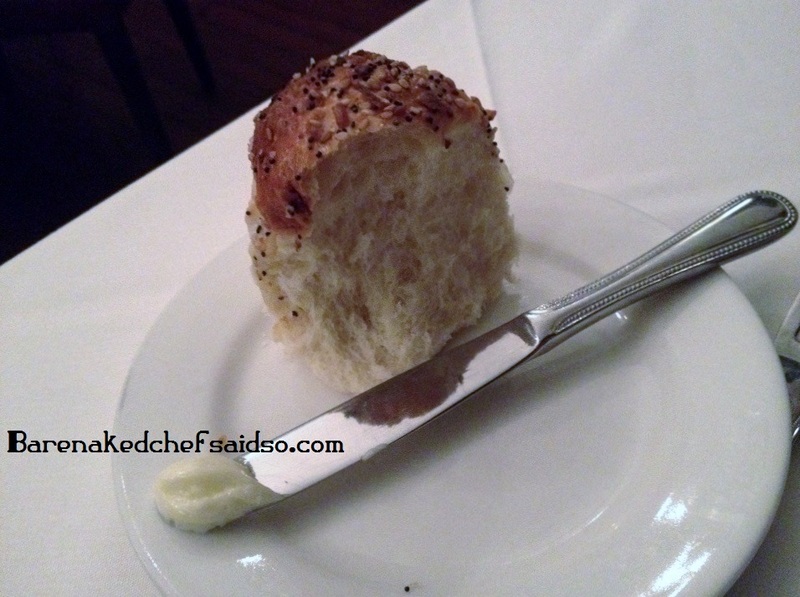 Maybe it is silly, but the bread that was brought to our table at the beginning of our meal was so delicious, I have to mention it. Soft, warm rolls topped by a salty, crunchy mixture of herbs and garlic and accompanied with a bit of real butter. I KNEW better than to eat the whole thing, but I just couldn’t help it. They were that good. Before our appetizers, the server brought an amuse-bouche (thanks, Top Chef for that vocab lesson!) for us to sample. Dustin MAY have let it slip that I write a blog, so there’s the reason for that extra treat. 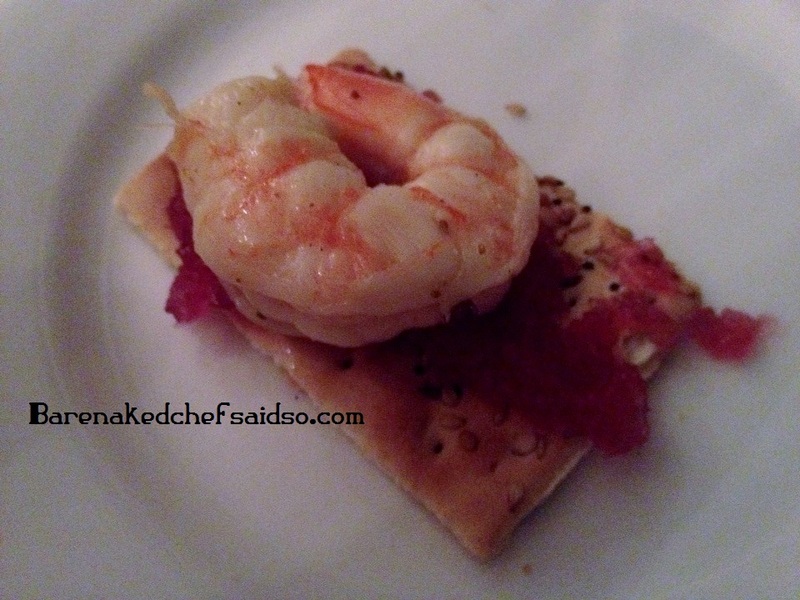 The treat was a pickled shrimp on a lavash cracker slathered with onion jam. The shrimp was firm, fresh and chilled and just slightly pickled with fenugreek, coriander, mustard seed, bay leaf and white wine. The jam was sweet with a hint of cinnamon. Beautiful together! 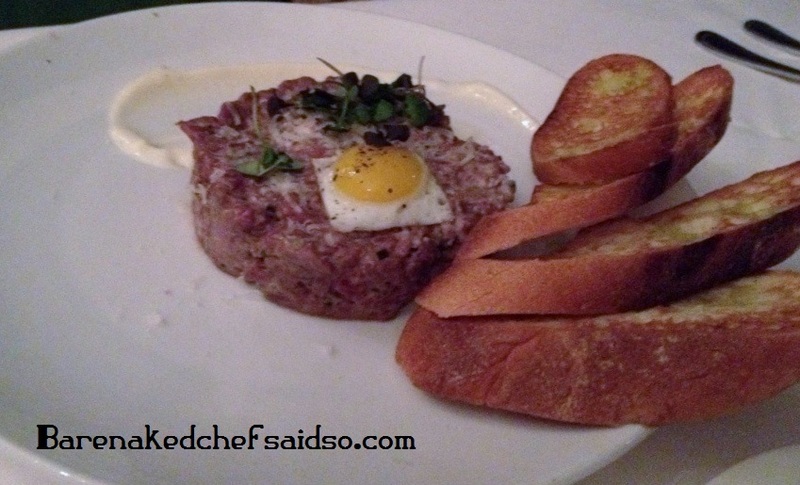 First course for Dustin was the Steak Tartare. This is a mound of chopped steak that is…gulp…raw! On top is an over-easy fried quail egg, with and herb aioli and served with crostini. I tried a tiny bite. I tried to enjoy it. But alas, the rawness I could not overcome. I think he does this on purpose so he doesn’t have to share with me. Whatever the case, he loved it. When we passed by the kitchen on the way to our table, I was struck by two things: First, that it was so small and so many people were being served out of it and second, that the oysters looked amazing. My research had me carefully selecting dishes to try, I even saved them in a Google Doc file so I wouldn’t forget…but sometimes you just have to make a decision on the fly. That was the right call. 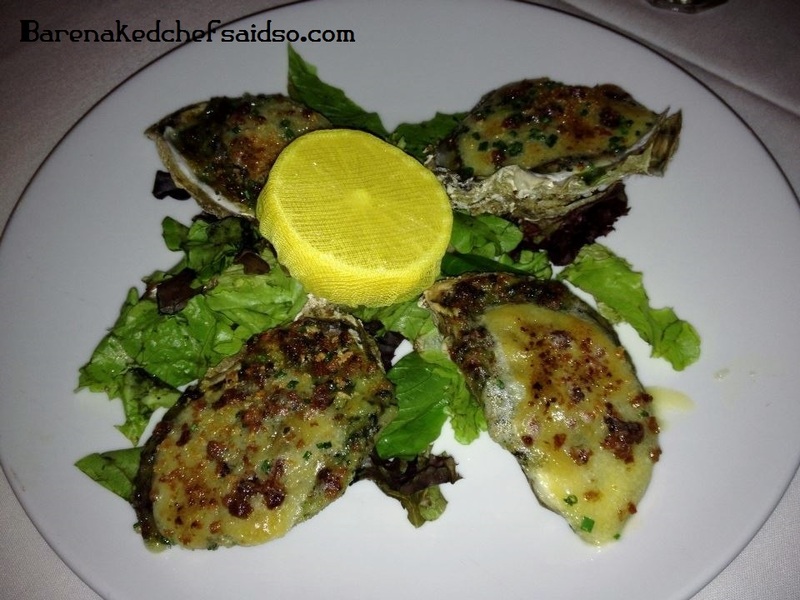 My first course was Oysters Rockefeller, and not only were they beautiful, but delicious as well. The creamy and cheesy spinach sauce with a hint of bacon capped these perfectly cooked oysters and then finished with a few chives and a squeeze of fresh lemon. It was the perfect bite. If you go, do NOT miss these. Another caveat: You can order them in any number, I got 4. While waiting for our main courses to arrive, the server brought us another treat from the chef. This one was seared scallops and they were so blissful. The scallops were perfectly seared with a crispy crust and tender inside. 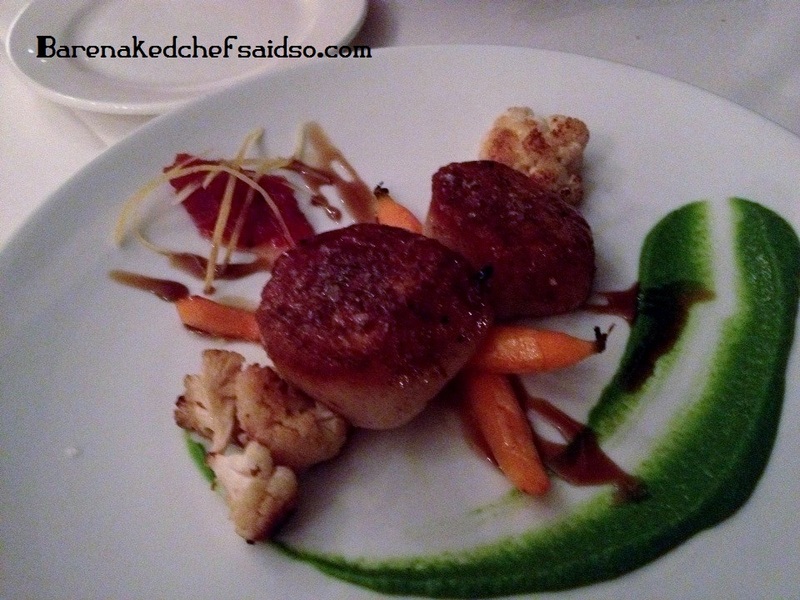 They sat atop a bright green fresh pea puree’, roasted sweet baby carrots, jalapeno jam and roasted cauliflower. There was also a sherry gastrique underneath that had an Asian flavor, tangy and sweet, that owned me. My husband pronounced those the best scallops he’s ever had. So, no way we could eat more, right? Wrong. 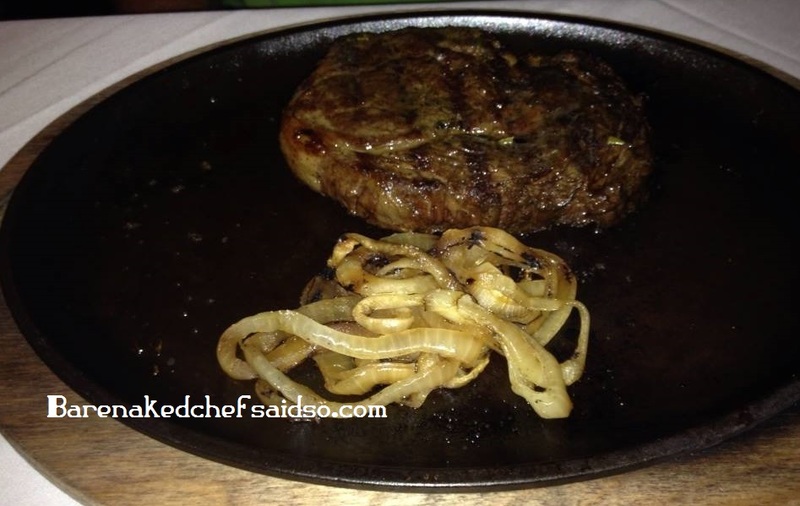 Here come the steaks…Dustin opted for the dry aged Ribeye with chargrilled onions. 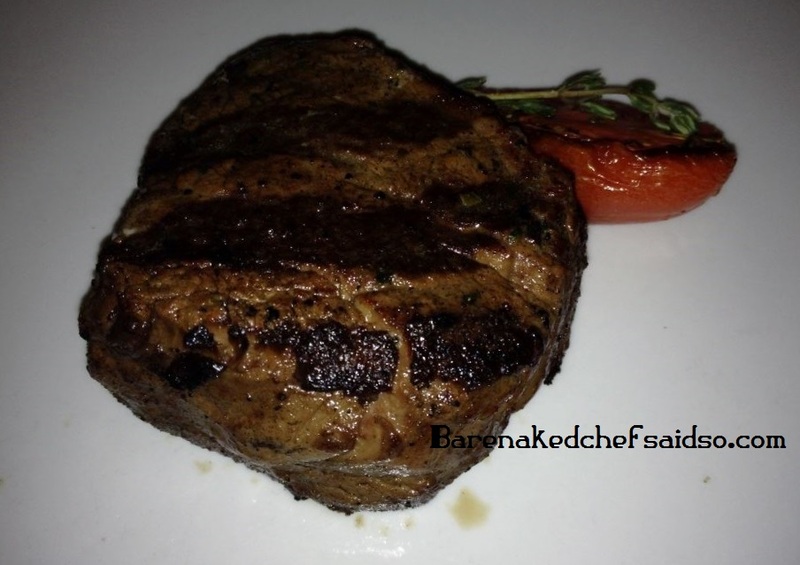 It was so flavorful with a crusty outside and a tender interior, cooked perfectly. Chargrilled flavor was very prominent and wonderful. I chose the filet mignon. I always get berated because there is not enough fat marbling to properly flavor the meat, but tonight this was no problem. My steak was soft to the touch with a perfectly crusted exterior. The chargrilled flavor was so delicious. It’s not over yet. The waiter told us that the King Crab was caught by the guys on the TV show. Sold. It was huge, spiky and worth every pinch trying to get it out. So much sweet crab meat. I can’t even. So this was one of those fancy restaurants where the sides are purchased individually. We each got one and shared. My research told me to try the truffle fries, but my husband was dead set on the Macaroni and Cheese and I couldn’t see getting 2 starches. So, I chose the roasted mushrooms. 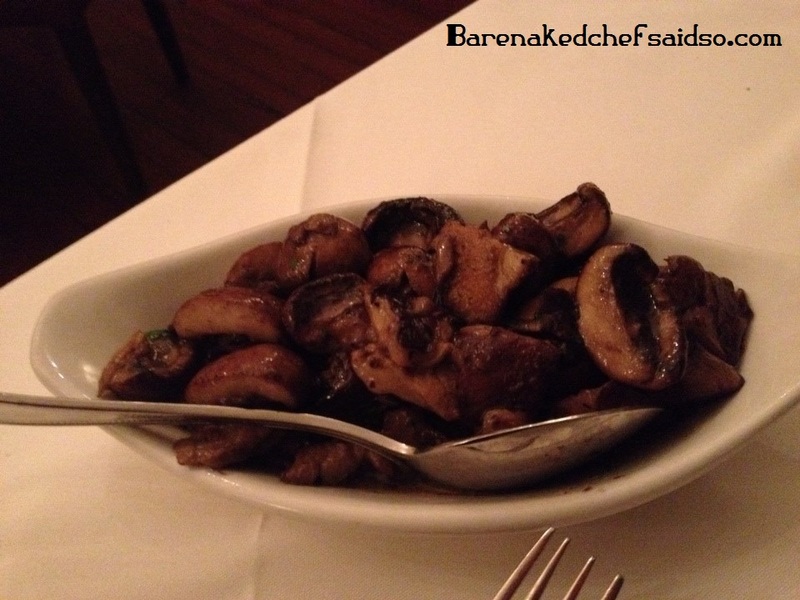 I adore mushrooms, but you know…these were mushrooms. They were great, but you could do the same at home. If you go, and want 2 starches, don’t give in to guilt…just get them both! 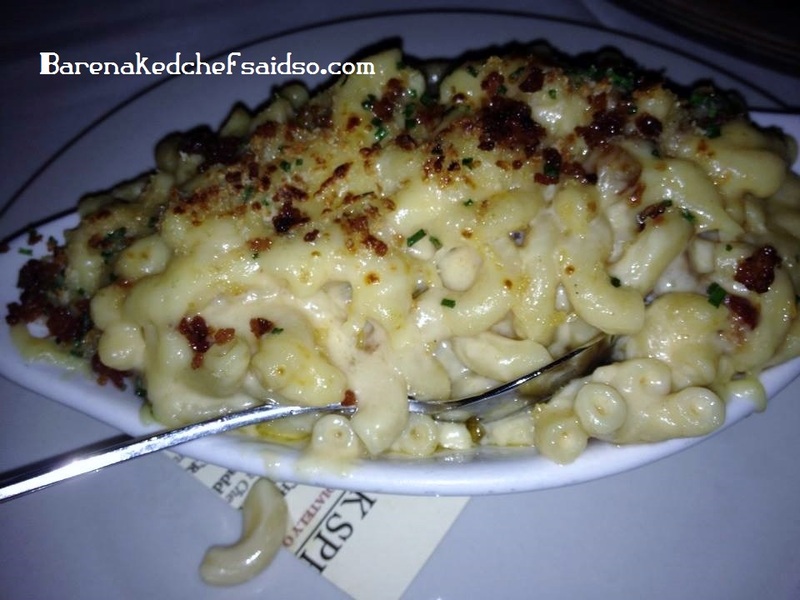 The bacon macaroni and cheese was so creamy and worth every calorie. The bacon added a smokiness to the cheese and the noodles had just enough bite still in them to provide a bit of texture. But not too much, no one wants crunchy macaroni and cheese. If you dine here, one of you must get this dish. This was our first night in this magical city and our best meal. 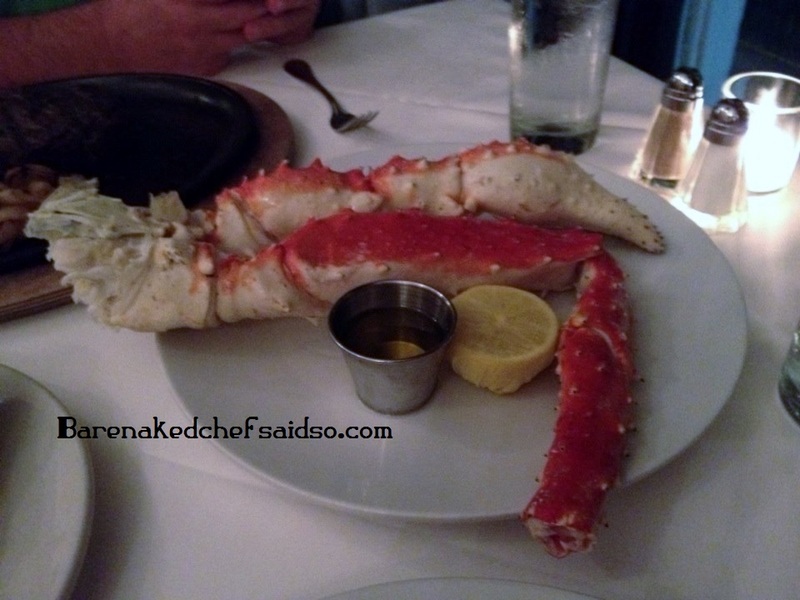 The food was amazing, the restaurant was beautiful but the service we received was so attentive, it made the night. Dustin and I disagree what our server’s name was, so I looked on my receipt. It stated he was “The Bruce.” So if you decide to go, you know who to ask for!